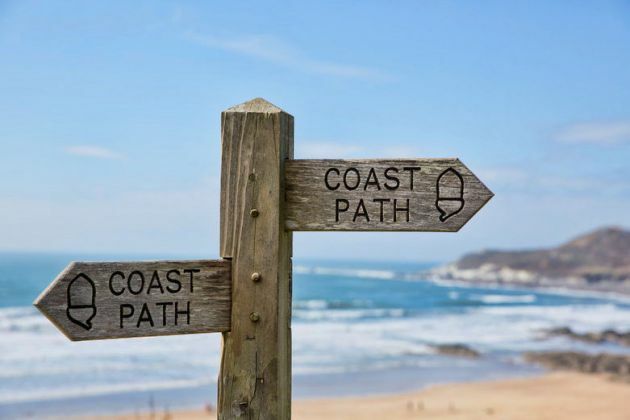 The Cornish contribution to the South-West Coast Path, England's most extensive National Trail, comprises nearly three hundred miles of stunning variety. The north coast is a wild and windswept affair, with sections still so isolated that it is possible to travel for hours without seeing more than a handful of people. Ancient field systems and Neolithic monuments litter this demanding leg of the trail, which passes over sheer 400 foot high cliffs and plunges down to countless remote rocky coves, where if you are lucky you will see colonies of grey seals nursing their pups. Stark remnants of the great Cornish tin mining boom dominate the landscape as you approach St Just, an area that has been granted UNESCO World Heritage Site status in recognition of the profound historical testimony these majestic ruins represent. After rounding the Land's End peninsula the path changes direction to hug the more sheltered south coast with its lush wooded valleys filled with tropical plants. An outcrop of Serpentine Rock begins at Kynance Cove on the Lizard Peninsula and it is this quirk of geology that truly gives the Lizard Point, England's most southerly extremity, its distinctive character. Labelled 'Serpentine' because it resembles snakeskin when wet, this is the largest outcrop of this unusual ancient igneous rock in the country. To the west of the cove a series of interconnected caves bear a dramatic witness to centuries of coastal erosion. The trail takes advantage of seasonal foot ferries to navigate the great estuaries of the River Fal and the Helford Passage, whose mysterious creeks and inlets were once a hiding place for pirates and smugglers. As you continue northwards an interesting, if ugly, china clay landscape soon gives way to the steep cliffs and spectacular views that represent a stunning slice of Heritage Coast extending all the way from Polruan, on the east shore of the River Fowey, to Rame Head. Here the trail turns inland to take the ferry from Cremyll across the River Tamar into Devon.